Season 2 of Luke Nguyen’s Vietnam aired a few months ago on the Cooking Channel. If you have not watched his show before, you should check it out. I love the cinematography of Vietnam scenery and food. It makes me want to visit Vietnam again so bad! Anyway, this Tomato Pepper Tofu recipe is another recipe that was inspired by one of the episodes. 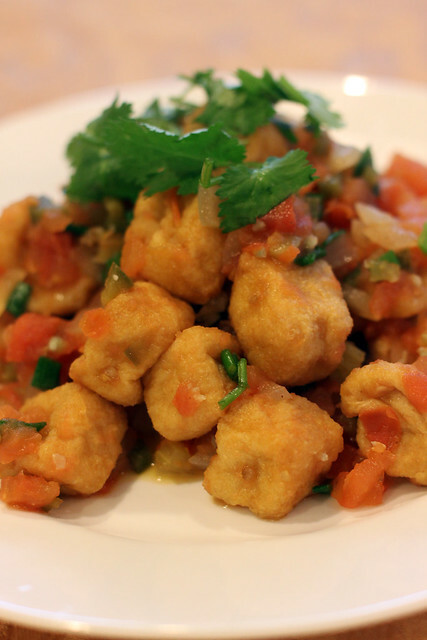 Tomato Pepper Tofu is basically tofu cooked and simmered in a Vietnamese style salsa. I modified this recipe just a bit to give it a more Vietnamese/Mexican fusion by adding jalapenos, diced onion and diced celery. If you don’t like to eat spicy, you don’t have to use too many chilies or pepper, but there should be some spice to it. I was also lazy and used prepackaged fried tofu and I don’t think I will do that again or recommend it to anyone. Fresh fried is always better! 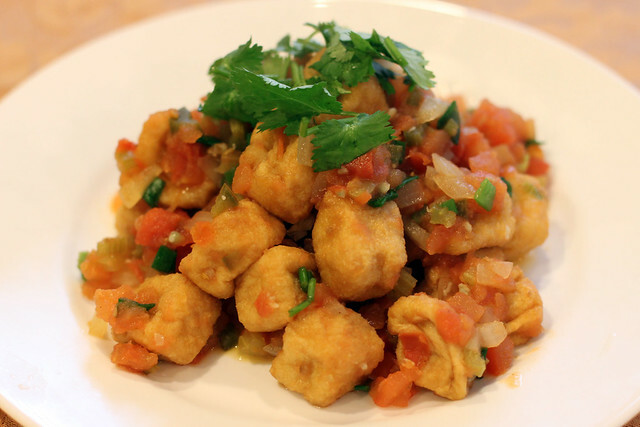 If not fresh fried, go to a Tofu shop, where they deep fry cubed tofu and buy it there and use it as soon as you can. Cut tofu into cubes. 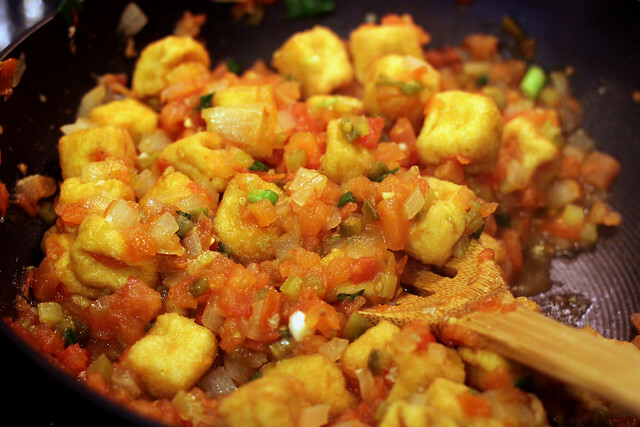 Pour enough oil into a wok to deep fry tofu until crisp. 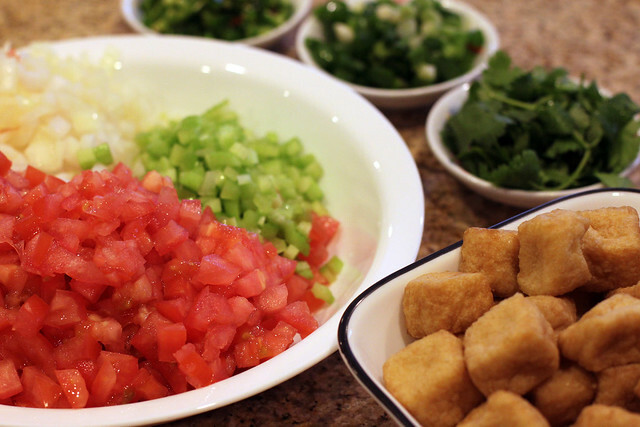 Remove the tofu from the wok and transfer to kitchen paper to drain. Tip: If you don’t want to make a mess in your house, you can buy pre-fried tofu at your local Asian Grocery Store. In a wok, add 1 tablespoon vegetable oil and add garlic, Thai chilies, and jalapeno and stir-fry on Medium-High for about a minute so all the fragrant flavors are released. Add the onions, and celery and let it cook for about 5 minutes. Add about 3 ounces of water to the wok, bring to a boil, then reduce the heat to a low simmer for 10 minutes. Add tofu, black pepper, and green onions. 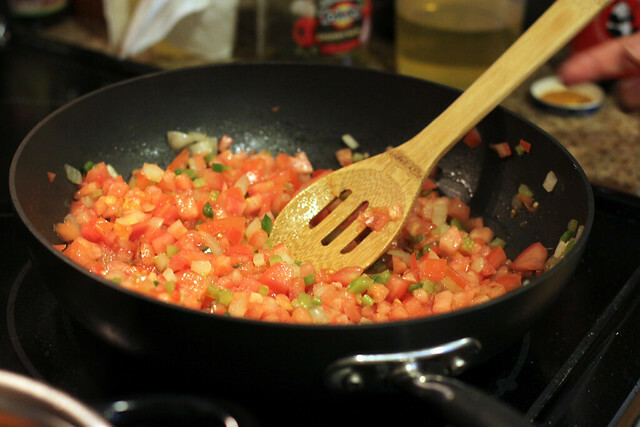 Gently fold ingredients together, plate, garnish with cilantro, and serve.